Birds fascinate us for many reasons. Flight, beauty, the glimpse into the world of dinosaurs, to mention but a few of those reasons. The migration stories of many of those birds is another. Who doesn’t marvel at Arctic Terns flying from one polar region to another, twice, every single year. Or at stories of a bird like Red Knot B95, twenty-one years old and logging miles that could take it to the moon, and half way back. 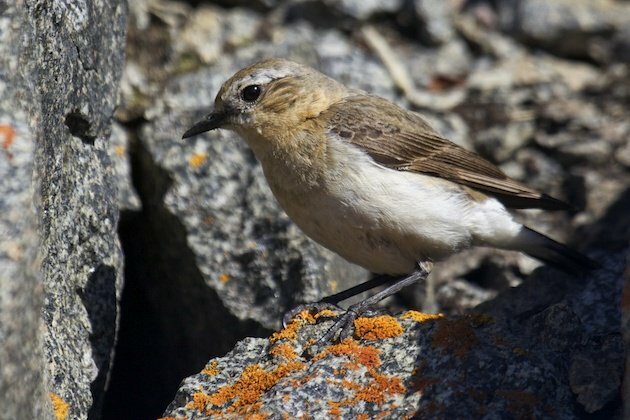 To my mind the single most compelling migration story has to be that of the bird with my favourite specific name (well now that Troglodytes troglodytes has been split into oblivion), the Northern Wheatear, Oenanthe oenanthe. 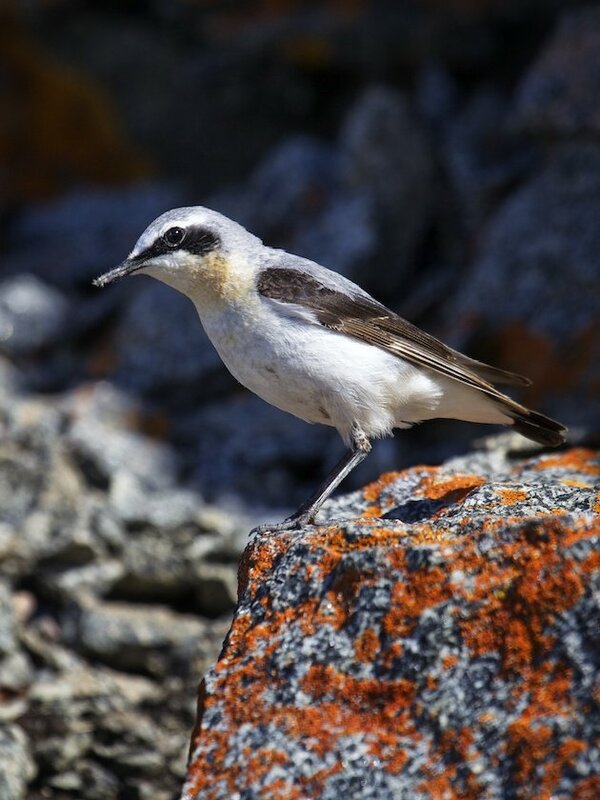 A male Northern Wheatear. Sexes are highly dimorphic. Typically, at least here in North America, we think of migration as a north-south affair. And for the most part it is. We are familiar with the story, birds flying north in the boreal summer, taking advantage of the warmth, long days, and abundant insect life, to raise their young. 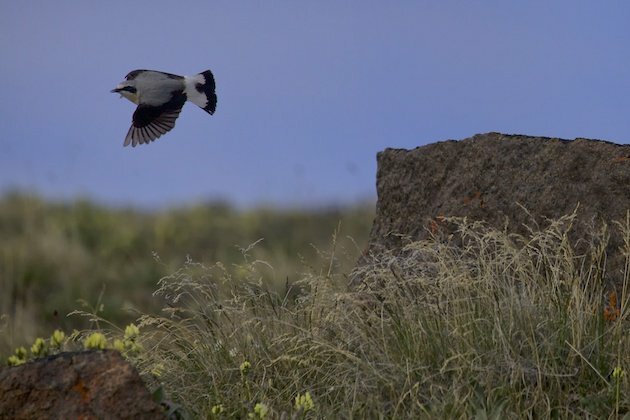 As summer ends these same birds (and the new year’s broods) then escape the snow and ice and head south for the austral summer, finding warmth, long days and abundant insect life. In the High Arctic we find several migrating species that break that mould. B95 and his Calidris canutus rufa kin may travel back and forth from South America to the Arctic, but another subspecies of Red Knot, Calidris canutus islandica, makes the journey up here from Great Britain and other parts of Europe. So does one of our small plovers, the Common-Ringed Plover. 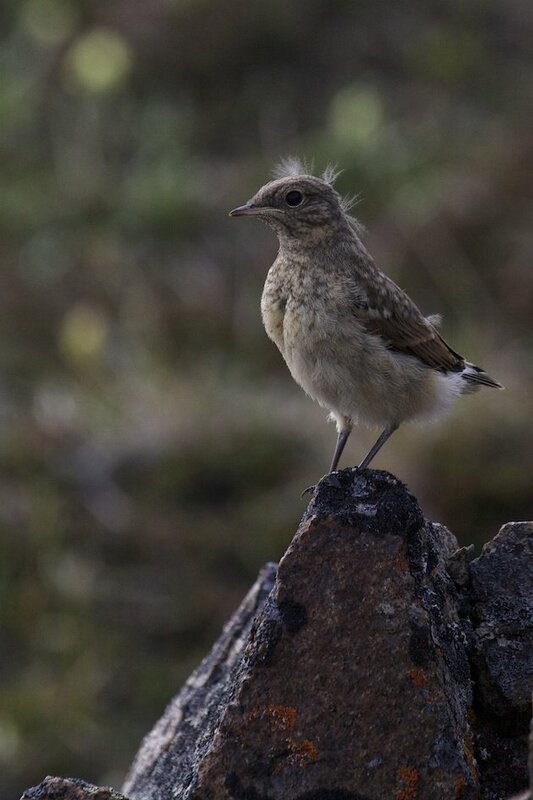 I marvel at their journey, but the Northern Wheatear takes it one giant step further. They also migrate to and from the High Arctic, crossing the Atlantic to Europe, but they keep going, down across the Mediterranean into Africa. 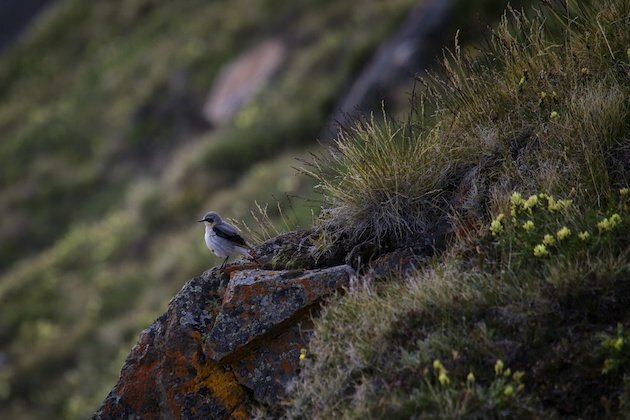 This tiny passerine winters in Africa, places like Tanzania, Nigeria, Somalia. From the Tundra to the African Steppes. In my neighbourhood they’re not especially common, but they nest here every year. This population’s breeding range is covers much of the Eastern Arctic, from northern Labrador up to Ellesmere, in as far west as the Kivaliq region (Rankin Inlet, Arviat). Baffin Island, where I live, is the core of their range. Their journey between the Arctic and Africa takes them from here, across Greenland and the North Atlantic, onto Great Britain and then south through France, Spain, across the Mediterranean and down into Sub-saharan Africa. It is a 15,000 km round trip, for a bird that only typically weighs in at about 28 grams, or an ounce. 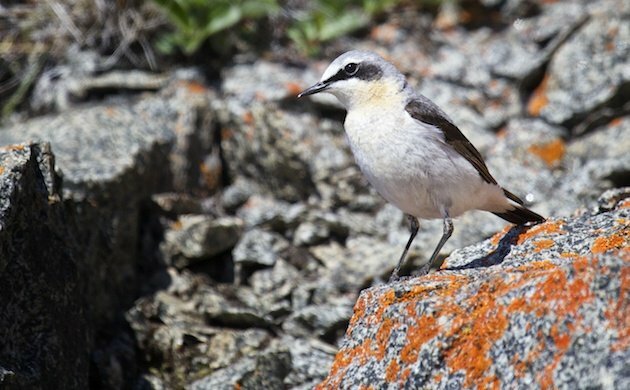 The population that nests in the western reaches of North America’s Arctic will cover about twice that distance, through Asia and down in to Africa. The male takes flight showing off that white rump that helps identify it, even from a distance. 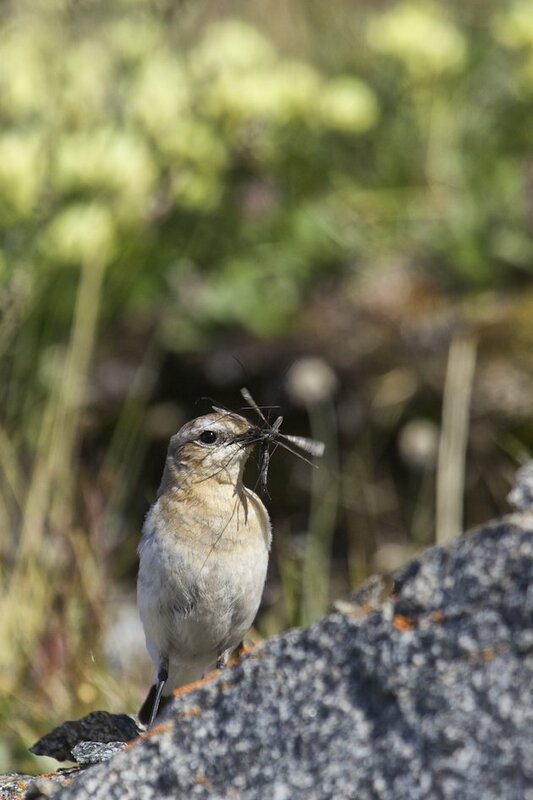 In my experience here, the Wheatear arrive at the end of May to early June and quickly establish territories. 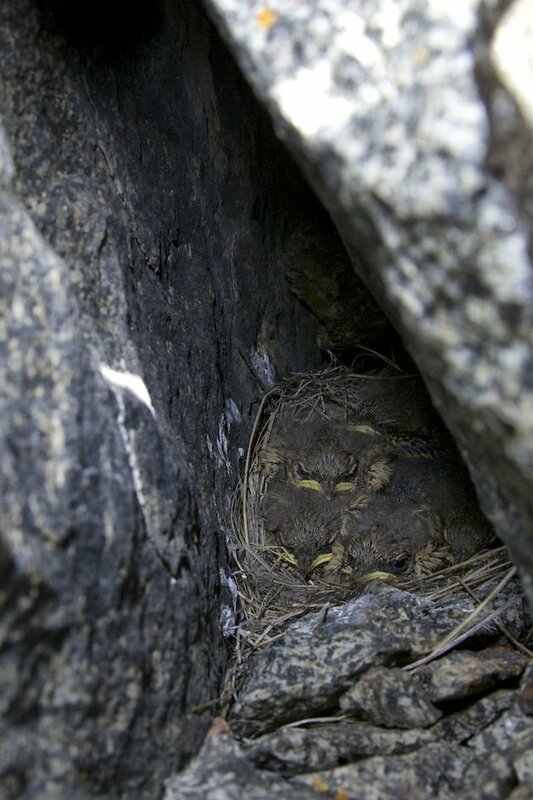 Nests are usually made in a sheltered cleft in rocks. Anywhere from 3-8 very pale blue eggs are laid, incubated by both parents. The young grow quickly on a steady diet of Crane Flies and other insects and spiders. When I regularly visit a nest during a season I’m always startled at how quickly the nestlings grow, visible changes happen each and every day. They only spend about two weeks in the nest before fledging and making their way in the world. Around now they’ll be winding that way on a long and unique journey. Coming soon to an African Savannah near you. Both sexes feed the young. 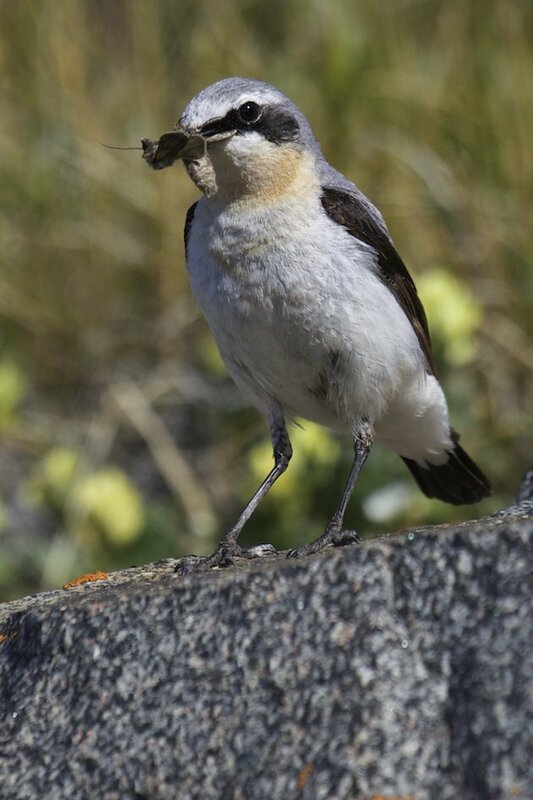 Here’s the male with an Arctic butterfly for the brood. A female with a couple of Crane Flies, by far the most abundant prey item. Male with one of the fledglings. Standing tall, fledgling about a day after leaving the nest. Surveying the area, the wheatear are often seen on exposed perches. We have shorebirds coming back, but also Dollarbirds, Koels, Channel-billed Cuckoos and more! Thanks Clare. The only shorebirds still lingering here are our Purple Sandpipers. Although I imagine there are phalarope off shore. I’d sure love to see some of those birds of yours some day. 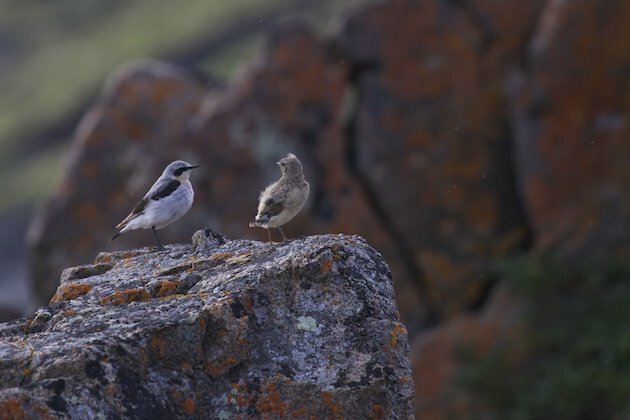 Thanks for sharing great pictures and interesting info on these hearty little birds. Ditto Clare K – would love to see one of these birds someday. Truly magical photos, and a fascinating life story! Thanks so much for a great post. Thank you Jean and Wendy.